The international bestseller 'Hysterical, harrowing, honest... I really loved this book' Jarvis Cocker'A brilliant, jangling opus to Rhodes's frantic mind... I cannot write anything more affecting about Rhodes than he can write himself' Sunday Times'What [Rhodes] describes in Fire On All Sides, writing with the same passion and energy he has when talking, are less destructive, more life-enhancing avenues to cope with anxiety, depression and trauma that he has found effective' Daily Telegraph'Rhodes writes like he plays - with power and intensity... Deeply stirring' Evening StandardFor many of us who suffer from depression or anxiety, the simple act of endurance, of having to appear 'normal', is a daunting, painful and heroic task. Getting out of bed, packing the kids off to school, showing up for work, preparing dinner... These can be astonishing achievements when it sometimes takes a superhuman effort simply to stand upright. How do you keep going? 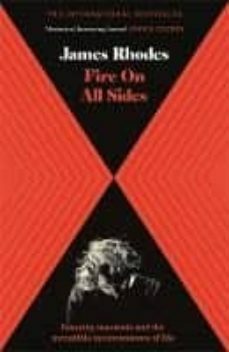 How do you do what you do, day in, day out, conforming to people's idea of you and functioning in the way society expects you to, when all you want to do is disappear and hide?In Fire On All Sides, Rhodes attempts to find how to make the unbearable bearable in the most exposing circumstances imaginable. As he embarks on a gruelling five-month concert tour, performing in front of thousands of people, the tortuous voices in his mind his constant companions, he has no choice but to face these wild, mad ramblings head on. Luckily, there is the music. There is always the music. Bach, Chopin, Beethoven - they are his holy grail, his mechanism for survival. Just.This is an important, urgent book. It's about going through your day feeling like you can't find a way out of the crazy, it's about not setting the happiness bar too high, it's about accepting the messy imperfection that is life.Rhodes explodes the myths surrounding depression, anxiety and stress - the plagues of our society - into a million pieces, then sticks them back together again with his characteristic thought-provoking, laser sharp and humorous style. The really good news? It's going to be OK. Just.